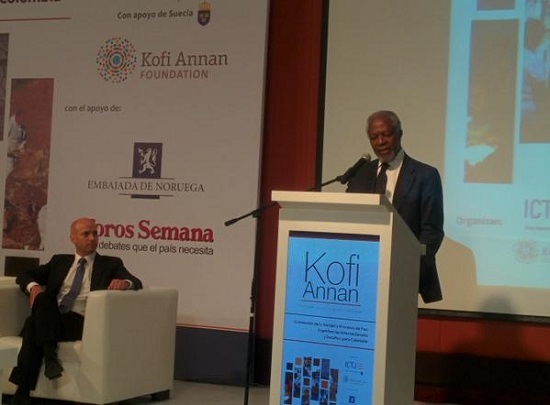 Mr. Kofi Annan, in his Keynote Address to conference participants this morning, reflected on the compromises and trade-offs that must accompany a peace process. However, he stressed that justice cannot be traded for peace – in the short or long term. Mr. Annan’s visit to Colombia this week has generated a great deal of attention, helping to bring to the fore society's broad, ongoing demands for justice in relation to the peace process. In this regard, he expressed his support for Colombia’s “collective struggle” to close the long cycle of violence and foster the virtues of reconciliation, solidarity and peace. As the former UN Secretary-General and a Nobel Laureate, few international figures are as well-situated to address issues of peacebuilding and justice here in Colombia. Since leaving the United Nations in 2006, Mr. Annan has actively pressed for policies that will meet the needs of the poorest and most vulnerable. Indeed, the Government of Colombia and the FARC guerilla group are now working to address the needs and rights of the many victims of the conflict as an essential element of the peace process in Havana. Turning to an issue often raised in relation to official truth seeking in Colombia, Mr. Annan addressed the pursuit of criminal accountability for the many armed actors in the conflict. In forceful terms, he cautioned that “truth seeking cannot substitute for criminal justice” because both are building blocks in the reformation of the state and the healing of society. He made example of the Argentinian truth commission, which famously used the phrase “Nunca Más” (never again) as the title of its report. What is now so unique about Argentina's commission is that it dealt with only one issue: the disappeared. Indeed, in recent years, truth commissions have tackled a wide variety of violations and scopes of inquiry – as is detailed in the joint report published last year by ICTJ and the Kofi Annan Foundation.